This is a superb first time property purchase comprising of this good sized three bedroom end terrace house set upon this much larger than average corner plot located upon the corner of Worsley Road and Worsley Close. Enjoying the benefits of gas central heating and uPVC double glazing this pleasant property comprises entrance hallway, tastefully decorated lounge, dining kitchen, lobby with boiler room, landing, modern bathroom and three good sized bedrooms. One of the key selling points to this family home has to be the plot which offers a driveway creating ample off road parking and then then lawned garden to the front and large lawned area to the side screened via an established hedge around the perimeter. Rear garden enjoying a sunny aspect. Viewing is highly advised to appreciate the property in question. With decorative glazed composite entrance door to the front elevation. Coving to the ceiling. Laminate wood flooring. Staircase leading to the first floor. Tastefully decorated and having uPVC double glazed window to the front elevation. Coving to the ceiling. Gas central heating radiator. Offering uPVC double glazed window to the elevation, the kitchen is neutrally decorated and has coving to the ceiling. Equipped with a range of wall and base units with contrasting roll edged work surfacing with inset stainless steel sink and drainer. Splashback tiling. Plumbing for washing machine and dishwasher. Gas cooker point. Space for a fridge/freezer. Gas central heating radiator. Tiled floor. Having walk in pantry. With tiled flooring and having fitted shelving. Offering uPVC double glazed stable door and window to the side elevation. Wall mounted gas boiler. Understairs storage. uPVC double glazed window to the side elevation. Loft access to the ceiling. Storage cupboard. The first of the double bedrooms has a uPVC double glazed window to the front elevation. Coving to the ceiling. Gas central heating radiator. uPVC double glazed window to the rear elevation. Coving to the ceiling. Gas central heating radiator. The third and final bedroom has a uPVC double glazed window to the front elevation. Gas central heating radiator. Coving to the ceiling. This lovely modern bathroom has a uPVC double glazed window to the rear and side elevations. Fitted with a modern white suite comprising pedestal wash hand basin, close coupled w.c and a L-shaped bath with shower screen and shower fitment. Tiling to the walls. Tiled flooring. White gas central heating towel radiator. 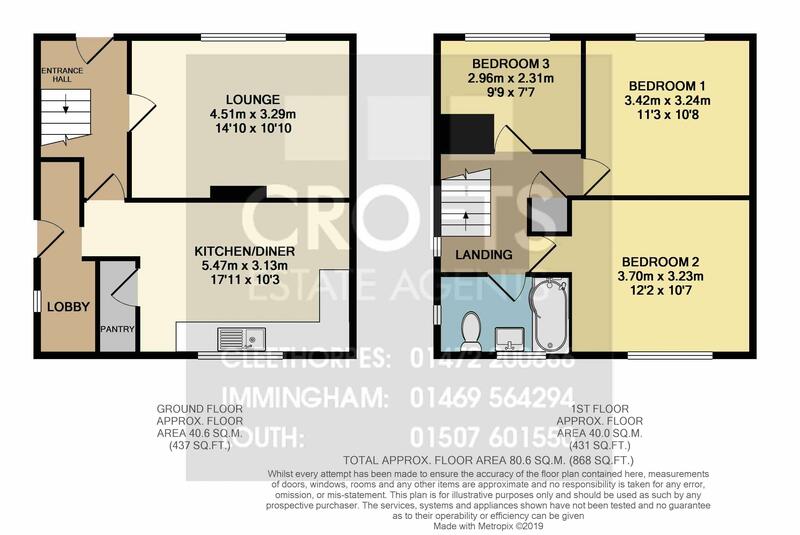 This property is set upon this good sized corner plot with gardens to three aspects which are majority lawned. The front has driveway creating ample off road parking and standing for a caravan or similar. Side garden enjoying a great degree of privacy hidden from the road via an established tall hedge. Rear garden enjoying a reasonable sunny aspect.